I’m introducing 2 kinds of Korean tofu side dishes to you today! 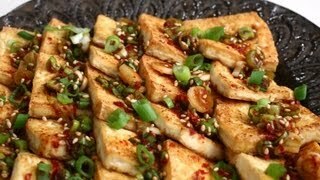 This one is the recipe for pan fried tofu in soy sauce, and we’ll also have a dosirak review when we’re finished making it (the other dish in the video is Dububuchim-yangnyeomjang). 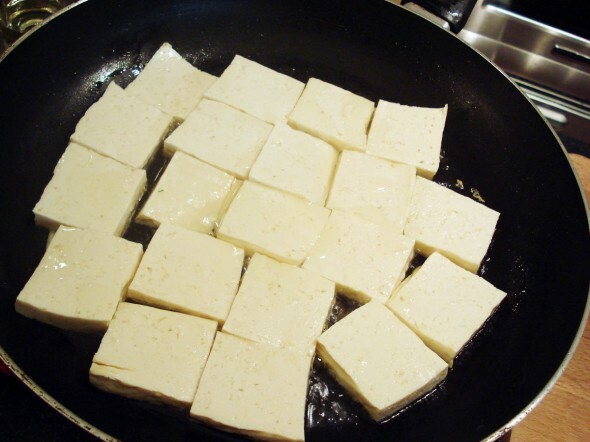 Slice the tofu into 10 bite size pieces (¼ inch thick rectangles). Towel off each piece with a paper towel. Heat a pan and add 1 to 2 tbs of vegetable oil. Add the tofu and lower the heat. Cook over low heat for about 5 to 7 minutes until the bottoms of the tofu pieces turn golden brown. Turn over each piece and cook another 5 minutes. 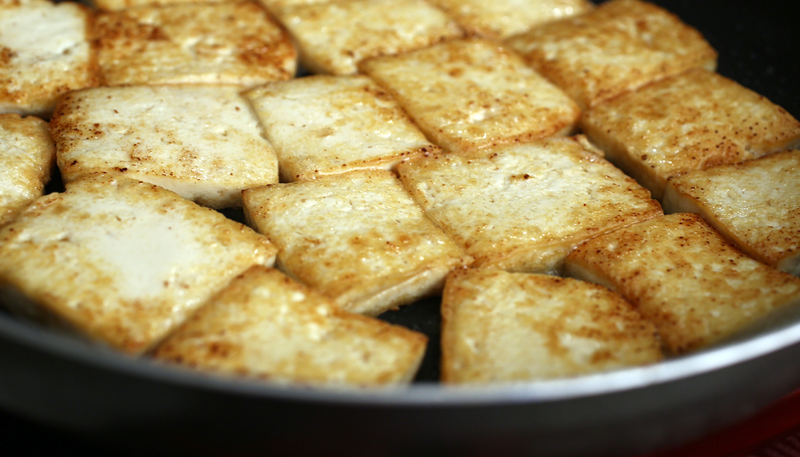 Add 1 clove minced garlic, 1 tbs soy sauce, 1 tbs corn syrup and stir, to caramelize the tofu. Turn the heat off and transfer the cooked tofu to a serving plate. Sprinkle some roasted black sesame seeds over top before serving. Serve with rice as a side dish, or in a Korean lunchbox. Let’s review your Korean cooking skill by making dosirak (lunchbox) with this. In this case I also prepared a spinach side dish (shigumchi namul) and a breaded fish pancake (using my cod jeon recipe) to go with the dubu-ganjangjorim. This dosirak is not only a healthy, well balanced meal, but also colorful and delicious! Try it out! Posted on Thursday, September 10th, 2009 at 10:49 am. Last updated on October 5, 2014. Posted February 24th, 2017 at 12:10 pm | Log in to reply. Posted February 4th, 2016 at 5:36 am | Log in to reply. Posted February 1st, 2016 at 12:31 pm | Log in to reply. I made it, thanks maangchi. .
Posted February 1st, 2016 at 12:38 pm | Log in to reply. Posted February 2nd, 2016 at 2:16 pm | Log in to reply. Your pan-fried tofu looks very delicious! Posted November 17th, 2014 at 9:19 pm | Log in to reply. Very easy and very good! I added a bit of hot chili paste to give it a bit of heat. Makes me miss kimbap heaven in Taegu! Posted August 21st, 2014 at 9:13 am | Log in to reply. Hi, your blog has been very helpful for me as an expat living in Korea. 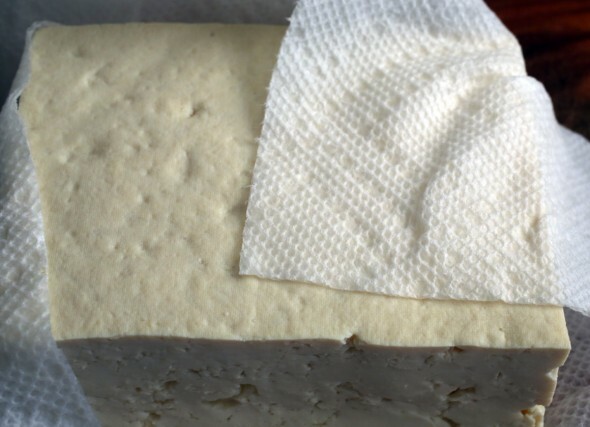 Would you be able to tell me how would I ask for firm tofu at a local Korean market? Posted June 17th, 2014 at 5:06 am | Log in to reply. Hi,this is my first time watch your tutorial and want to try this dish..but, what if i don’t have corn syrup? can i use honey instead and have a same result? thanks! Posted June 19th, 2014 at 9:23 am | Log in to reply. yes, you can use honey or sugar. Posted April 14th, 2014 at 4:14 pm | Log in to reply. I see the picture above has beans cooked with the rice. What type of beans do you use? Do you just add the dry beans to dry rice, rinse, and cook them in a rice cooker or is there a different way to make this? Thanks! Posted June 19th, 2014 at 9:27 am | Log in to reply. oh, they are fresh green peas. Add any type of fresh beans to your rice and cook. Posted September 12th, 2013 at 9:43 am | Log in to reply. Posted September 13th, 2013 at 3:15 pm | Log in to reply. This recipe was originally posted on September 10, 2009 at 10:49 am by Maangchi. It was last updated on October 5, 2014. The video was watched 780,957 times on YouTube & has 4,888 likes!